Outlook 2010 has a option to automatically clear or empty deleted items folder. This is similar to empty deleted items folder in Outlook 2007. 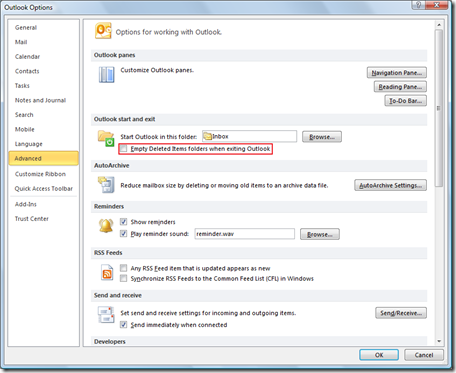 Under Outlook start and exit section enable the check box with label as Empty Deleted Items folder when exiting outlook. And click OK to save the changes. Now when ever you exit Outlook, the deleted items folder will be automatically cleared.